Another problem for learners when looking for a course is the syllabus. Look in a search engine for a language course and you could get a site from the USA, Japan, or even Australia. So what syllabus is a course based on? A Japanese syllabus? An Australian university syllabus? An international one? Or none at all? Has the course been put together by an enthusiastic amateur who thought it might be a great idea to write a course? Or has it been written by a professional team, writing for European learners? Does the site actually offer a language course or just a random selection of topics: grammar description, lists of vocabulary, information how to ‘communicate’ in certain situations? Even if you are not worried about the syllabus, you will want to know what the content is about. What are the topics of the course? Do they meet your needs? And how comprehensive are they? Do the units help you to interact in general everyday situations that you are likely to encounter? There is also the question of level. Are you a beginner? Is the course for beginners? Does the course even say who it is for? And ‘beginner’ according to whose definition? The Council of Europe has described very clear levels of attainment for European language learners. Does the course meet these requirements? Does it even mention or acknowledge them? Will you achieve a recognised level, such as the European level A1 Breakthrough, or A2 Waystage? Or will you just get a piece of paper from an organisation that says, ‘Well done! You have completed the course’? And finally, there is the question of approach. Does the course really help you to learn? Does it engage you actively in the learning process? 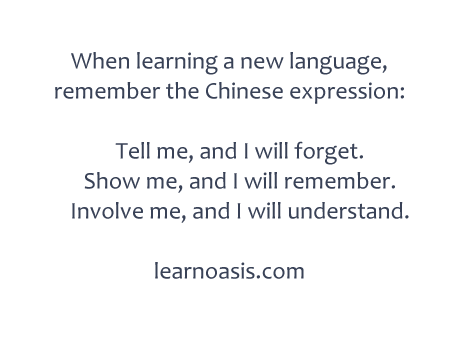 This is important because all too often an online course will say, ‘In this unit you will learn about the simple present’ or ‘You will learn how to ask questions’. Then you will get a text to read. Reading is not learning. Learning is more than just reading. Check out how often you are told you will learn something and you sit there and read a text. Learning is more than that. A site that helps you to learn will organise the material in such a way that there is a clearly structured learning process and not just a collection of reading texts.